This easy-to-grow, nutritious, cool-season crop is among the first greens ready to harvest. But plant it early because it’s quick to turn bitter and go to seed (bolt) as the weather warms and the days lengthen. Dark green color and handsome texture of savoyed varieties are great for edible landscaping. Well-drained, fertile soil, high in organic matter. Plentiful, consistent moisture. Tolerates slightly alkaline soils but is sensitive to acid soils. pH should be at least 6.0, but preferably in the 6.5 to 7.5 range. Must be planted early and grown when temperatures are cool. Needs consistent moisture. Will go to see (bolt) if too dry, or when days lengthen and temperatures warm. Varieties with savoyed (curly) leaves add interest for edible landscaping. frost - Young plants can withstand temperatures as low as 15 F to 20 F.
not native to North America - Not known in wild. Thought to be first cultivated in Afghanistan and Tajikistan. Germination temperature: 40 F to 75 F - May fail to germinate in warm soils. Days to emergence: 6 to 10 - About 3 weeks at 50 F. About 5 days at 77 F, but germination drops to about 30 percent . Seed can be saved 2 years. As soon as you can work the soil in spring, sow seed � inch deep, 1 inch apart in rows 12 to 18 inches apart (or broadcast seed across a wider area). Thin to 2- to 6-inch spacings. Closer spacings can stress plants and cause them to go to seed (bolt) sooner. Early planting is critical as dry soil, heat and lengthening days also encourage bolting. Later plantings benefit from some light shade from other crops. Follow early plantings with warm-season crops such as tomatoes or beans. Make succession plantings every week or two until average last frost date. Use bolt-resistant varieties for later plantings. Sow again in mid- to late summer for fall harvest. Seeds do not germinate well in warm soil, so increase seeding rate to compensate. Or pre-germinate seeds by placing them between sheets of moist paper towel in a plastic bag and refrigerating until they sprout. Spinach seedlings are difficult to transplant. For spring crops, start inside only if your garden stays too wet in spring to allow direct seeding. Start transplants inside about 3 to 6 weeks before last frost. Spinach is shallow-rooted and requires consistent moisture to prevent bolting. Water to keep soil moist. Mulch after plants are well established to maintain moisture and suppress weeks. Use floating row covers to prevent insect damage. Do not overfertilize with nitrogen. Only apply supplemental fertilizer if leaves are pale green. Add lime to make sure pH is at least 6.0. You should suspect that your soil is too acid if germination is poor and leaf tips and margins are yellow or brown. Plant in fall and mulch heavily for early spring crop. Leaf miners - Cover plants with fine netting or cheesecloth or floating row cover to protect plants from adult flies. Handpick and destroy infested (mined) leaves. Control weeds. Browse spinach varieties at our Vegetable Varieties for Gardeners website. Choose slow-bolting varieties for later spring plantings. 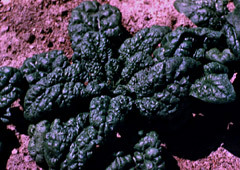 Disease resistance is more important for fall crops. Savoyed (curly) leaves are handsome and keep better, but are harder to clean. New Zealand spinach and Malabar spinach are warm-season greens similar to spinach, but different species. See separate Growing Guides.